Christina Rossetti’s “Maude Clare” was firstly published in the weekly magazine Once a Week on 5th November 1859. 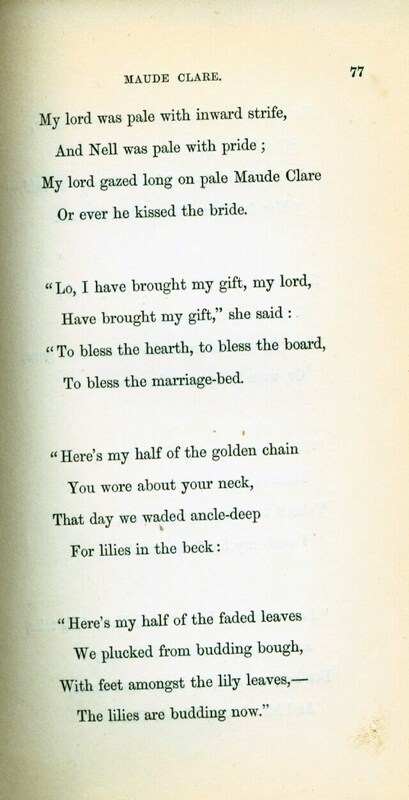 Although the manuscript version of the poem had forty-one stanzas, it contains only fifteen stanzas in Once a Week, and undergone further revisions by the time it appeared in Goblin Market and Other Poems (1862) as a poem of twelve stanzas. 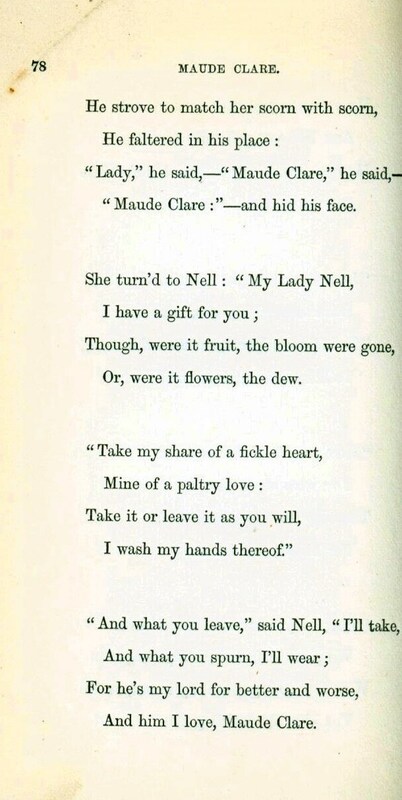 Following these alterations, the reader grows less sympathetic to Maude Clare, who disrupts the wedding of her former lover Thomas to his newly-chosen bride Nell, as the poem becomes shortened. It is noteworthy that despite these revisions which heavily influence the reader’s interpretation of the poem, “Maude Clare” has never ceased to attract wide readership because of Once a Week’s high sales estimate, its inclusion in all Rossetti’s poetry volumes which partially maintained its consistency, the nineteenth century anthologies and encyclopaedias , and its appearance in international newspapers. As already mentioned, the publication of “Maude Clare” in Once a Week attests to its initial popularity based on sales and the high status of the magazine for publishing illustrated poetry at affordable price of three pennies an issue (Hughes 68). Since it appeared in November, the estimated circulation between July and December in 1859 was 570.000. Likewise, the poem is accompanied with illustration by John Millais, who was one of the greatest artists of its time and a member of the Pre-Raphaelite brotherhood. That said, Millais’ involvement in Once a Week played a crucial part in establishing the initial success of the magazine because illustrations, as Kooistra argues, “increased the beauty of the publication, and hence its desirability, whether in periodical or in book form” (Kooistra 44). Like Christina Rossetti, who is the only Victorian poet “never entirely to have slipped out of view” (Blain 8), in a similar way, “Maude Clare” maintained its consistency and popularity on the market when it became republished in all Rossetti’s poetry volumes and in the nineteenth century anthologies and encyclopaedias. That said, after its publication in Once a Week, the poem consisting of twelve stanzas appeared in Rossetti’s Goblin Market and Other Poems 1862, and four years later, in The Prince’s Progress and Other Poems (1866). In 1875, it was included again in the collective work Goblin Market, The Princess Progress and other Poems. During Rossetti’s lifetime, the poem reappeared in Poems which was followed by another two editions issued in 1882, and 1890. 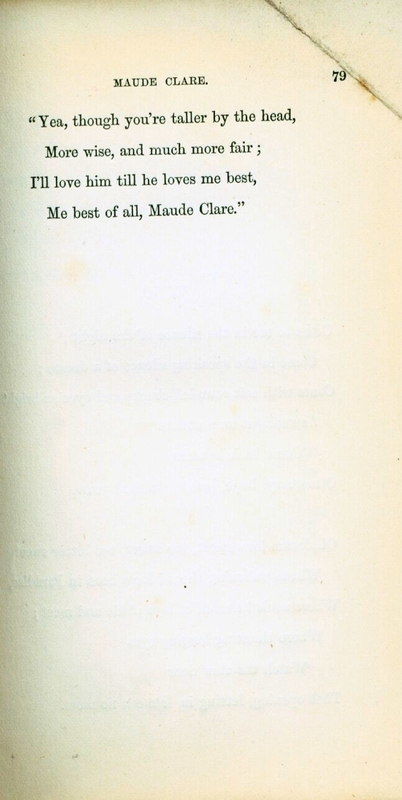 In the meantime, it is worth mentioning the fact that “Maude Clare” was singled out of the above mentioned works and found its place in the Fireside Encyclopedia of Poetry (1879), which according to Coates, it represents “all that is best and brightest in our poetic literature” (Coates v). The poem was also anthologized in Red – Letter Poems (1885), which contains a selection of the best poems ever written in the English literature. Additionally, The Globe Encyclopedia of Universal Information (1879), celebrates “Maude Clare” of all Rossetti’s works as a poem “in which it is impossible to detect a flaw” ( Ross 422). “Maude Clare” was also republished in newspapers such as the American Daily Evening Bulletin (1864) which included the twelve stanzas’ version of the poem, while the Australian Australesian (1875) published the former version of fifteenth stanzas. These international newspapers serve as an indication of the poem’s popularity outside its domestic boundaries. Lastly, since the poem continued enjoying popularity in the twentieth century, we can reaffirm Bell’s early opinion of “Maude Clare” in his Critical Survey (1898), as a work that ”will retain its high values in the future” (Bell 353). Bell, Mackenzie. Christina Rossetti: A Biographical and Critical Study. Boston: Roberts Brothers.1898. Print. Blain, Virginia. Victorian Women Poets: A New Annotated Anthology. London: Longman. 2011. Print. Coates, Henry. The Fireside Encyclopedia of Poetry. Philadelphia: Porter & Coates. 1879. Print. Easley, Alexis. First Person Anonymous: Women Writers and Victorian Print Media, 1830-70. Ashgate: Ashgate Publishing Ltd. 2004. Print. Hughes, Linda K. “Inventing Poetry and Pictorialism in Once a Week: A Magazine of Visual Effects.” Victorian Poetry 48.1 (2010): 41-72. Print. Kooistra, Lorraine. Janzen. Christina Rossetti and Illustration: A Publishing History. Ohio: Ohio UP. 2012. Print. The Globe Encyclopedia of Universal Information. Ed. Ross M. John. Edinburgh: Thomas C. Jack, Grange Publishing Works. 1879. Print. Young, Thomas. Red-Letter Poems. New York: Thomas Y. Crowell & Co.1885. Print.